In this Ableton Live tutorial, Dubspot’s Rory PQ introduces us to wavetable synthesis and demonstrates how to design single-cycle waveforms with Operator, build a custom wavetable synthesizer with Live devices, and setup waveform oscillators in Sampler. Included is a FREE Bass House Ableton Live project loaded with the custom wavetable synth rack, samples, and other examples covered in this tutorial. Wavetable synthesis is a powerful and unique form of synthesis that provides a more natural sound than other synthesis methods. Instead of using oscillators to generate simple waveforms like traditional subtractive synthesizers, sounds are generated from multiple single-cycle waveforms that have been recorded and stored in a buffer. Also known as sample-based synthesis, wavetable synthesis is a technique used to create some amazing sounds that evolve by modulating the wavetable position. Combined with filters, envelopes, effects, and other subtractive synthesis techniques, a wavetable synthesizer can be a powerful tool for any producer and is suitable for all styles of music. Some of the most common software wavetable synths are Native Instruments’ Massive and Serum by Xfer Records. There are several methods for generating waveforms that can be loaded into a wavetable synth. The most common methods are recording sounds from other synthesizers and downloading single-cycle waveform samples from the Internet. For this demonstration, we are going to look at how to generate custom waveforms using Live’s Operator instrument. Operator is an advanced and flexible synthesizer that combines the concept of ‘frequency modulation,’ also known as FM synthesis with classic subtractive and additive synthesis. Sound is generated from four multi-waveform oscillators called ‘operators’ that can also modulate each other’s frequencies, which is great for creating very complex timbres. In addition to the simple waveforms available in Operator, you can also create custom waveforms using the built-in waveform editor. You can also save custom waveforms for later use as .ams files. 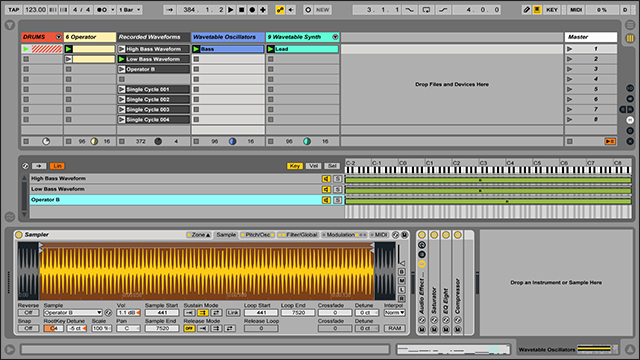 One of the advantages of this feature is that you can drag these .ams files into other Ableton devices such as Simpler or Sampler to use their modulation capabilities and other processing functions. Creating user waveforms with Operator is fun, and the number of unique waveforms that can be generated is endless. Creating your own waveforms is achieved by selecting ‘User’ from the Wave chooser or by selecting one of the built-in waveforms and then editing it by hovering your mouse over the Oscillator display area, so the cursor changes to a pencil and then drawing the amplitudes of the oscillator’s harmonics. The small display next to the Wave chooser gives a real time overview of what your waveform. There are also options to edit only the even or odd harmonics, and switches to edit the first 16, 32 or 64 harmonics. 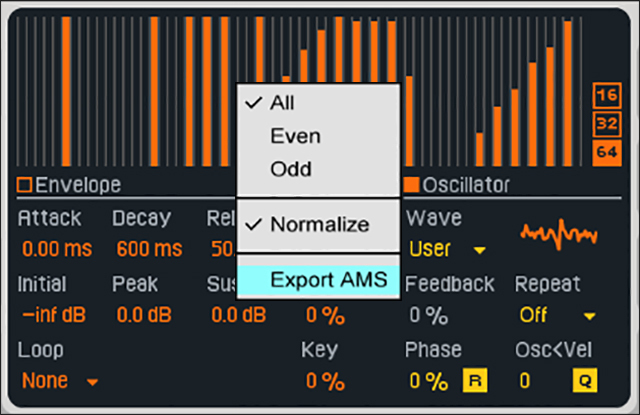 After creating a desired sound, you can record the results or export your waveform in .ams format to the Samples/Waveforms folder in your User Library by right-clicking on the Waveform Editor and choosing ‘Export AMS’ from the context menu. Saved .ams files can then be imported back into Operator by dragging them from the browser into one of the oscillator display areas or loaded into Simpler or Sampler. Bonus Tip: Waveforms can be edited further in Live. 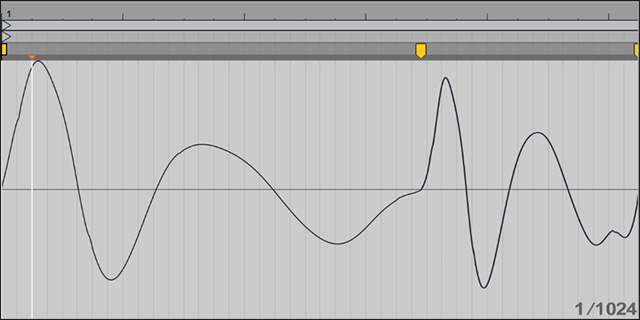 Experiment by drawing in envelopes or stretching the audio with Warp Markers in Live’s Sample Editor. You could even add effects and resample the results. 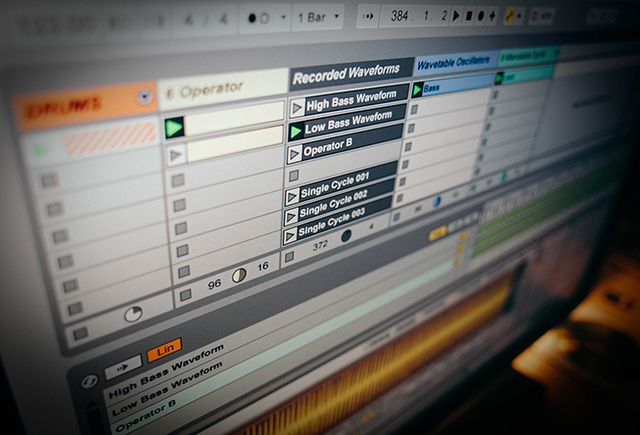 One of the most unique features that Ableton Live offers is the ability to build complex signal processors, dynamic performance instruments, stacked synthesizers, and more using Racks. By combining Live’s flexible Instrument Rack with multiple instances of Live’s Simpler or Sampler Instruments loaded with different waveforms, we can create an efficient wavetable synthesizer. Live’s Instrument Rack is the perfect tool for creating multiple device chains that operate in parallel. This feature allows us to load several different waveforms that we can process independently and morph between to develop some truly unique sounds. Let’s build a custom wavetable synthesizer from scratch using Live’s Instrument Rack and Simpler device. Drag an Instrument Rack from the Browser into a MIDI Track. Drag a Simpler instrument into the Chain list to create a new chain. Drag in an Audio Effect Rack after Simpler. This Rack will be used to set Chain Select Zones that filter the output signal for each chain so we can easily morph between waveforms. Right-click in the Chain list and choose ‘Create Chain’ from the context menu to create a new chain for the output signal. Activate the Chain button to display the Chain Select Editor. Drag out the Chain Select Zone to 16 on the Chain Select Ruler. We will adjust individual zones separately after we create additional chains. Adjust the fade range to attenuate the volume level at each chain’s output for smoother transitions. Macro map the Chain Selector to macro 1 on the Audio Effect Rack and then map that Macro to Macro 1 on the Instrument Rack. This Macro control will be used to morph between waveform layers. Macro map any desired parameters on Simpler to the remaining Instrument Rack Macro controls. For this demonstration, the Glide controls, Loop Fade, and ADSR parameters are assigned to Macros. Duplicate the Instrument Rack chain to create identical layers for our recorded waveforms. For this demonstration, we are using four chains. Adjust the individual Chain Select Zones and fades for each chain to separate them along the Chain Select Ruler to prevent all the waveforms from playing together at the same time. Load each Simpler with a single-cycle waveform and ensure Loop is activated. Process the sound further using traditional subtractive synthesis techniques and adding audio effects. Arguably the most powerful device that Live offers, Sampler is an advanced multisampling instrument that is extremely versatile, combining traditional sampling features with advanced sound design and synthesis possibilities. Sampler’s many features allow you to go deep into sound-shaping, giving you control over every detail of your sound. Its extensive internal modulation system makes it fun to create vibrant and complex sounds from even the most basic audio source material. Clicking on the Zone tab along the Title Bar toggles the display of Sampler’s Zone Editor where you can load a maximum of 128 samples. That’s insane! All samples contained in the Sample Layer List are given its own layer. You could load 128 single-cycle waveforms to build a custom synthesizer that essentially has 128 oscillators. That would probably sound like a volcano explosion of rubbish, but it’s exciting to know you’re not limited to how many oscillators you could work with in a single plugin. Unlike many third-party wavetable synthesizers, Sampler has a dedicated modulation oscillator per voice which can perform frequency or amplitude modulation (FM or AM) in addition to multiple modulation options and expression controls. The ability to stack several custom waveforms to create endless sound-shaping possibilities screams experimentation, and I hope it inspires you to create some incredibly unique sounds. Bonus Tip: Record waveforms from some of your favorite synths and build Sampler instruments that model those synths.